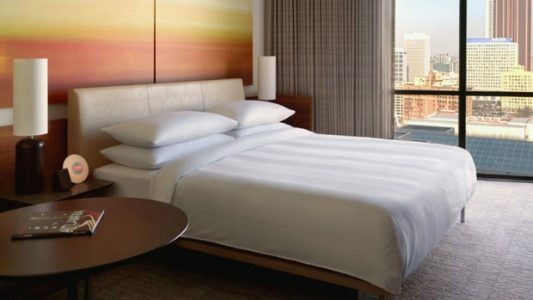 Atlanta Marriott Marquis recently revealed its extensive transformation, featuring redesigned guest rooms and suites that represent the new innovative guest experience that Marriott Hotels is rolling out across North America. The hotel offers more suites than any other hotel in the Atlanta market, providing ample multi-functional space for meetings, interviews, receptions or VIP accommodations with stunning floor-to-ceiling views of the city. Smart TVs equipped with streaming services such as Netflix and Hulu give travelers the option to customize their entertainment. A deluxe new bath in king rooms includes walk-in upgraded showers that enhance the bath experience. The transformation has also brought two floors of Stay Well rooms to the Marquis, making the property one of six in the Marriott International portfolio to offer this first-of-its-kind concept to enable healthy travel. Designed by wellness real estate and technology firm Delos, Stay Well rooms offer health and wellness features like air purification, circadian lighting, an allergen-free room sanitation process, vitamin C shower infusers as well as aromatherapy to instill a sense of calm, relaxation and overall well-being for guests while away from home. To read more at Travel Daily News, click here.